Do Poplar Bioenergy Farm Soils Contribute to Greenhouse Gas Emissions? Soil greenhouse gas emissions are just one piece of the puzzle in determining how growing poplar for bioenergy may impact the carbon cycle. Understanding how much carbon is released versus stored in the soil when land is converted to poplar farms and during poplar production is an important aspect of how poplar-based biofuels may alter greenhouse gas concentrations in the atmosphere. Brian Bell, a graduate student at the University of Idaho and a member of the AHB Sustainability Team, is comparing greenhouse gas emissions from soils at the AHB demonstration sites to the soils of adjacent agricultural fields and forests. He is investigating how emissions of carbon dioxide, methane, and nitrous oxide change when agriculture lands are converted to poplar bioenergy farms by measuring the exchanges of these gases at the soil surface. To measure greenhouse gas exchanges, researchers place a small chamber over the ground to collect air samples at regular intervals (Fig 1). These samples are then analyzed in the lab at the University of Idaho to determine the direction and rate of change of greenhouse gases concentrations. Carbon dioxide composes 97 percent of greenhouse gas emissions at the poplar bioenergy sites. The soil releases carbon dioxide during respiration of the roots and as soil organisms consume organic matter. Soil microbes are both producers and consumers of greenhouse gases. 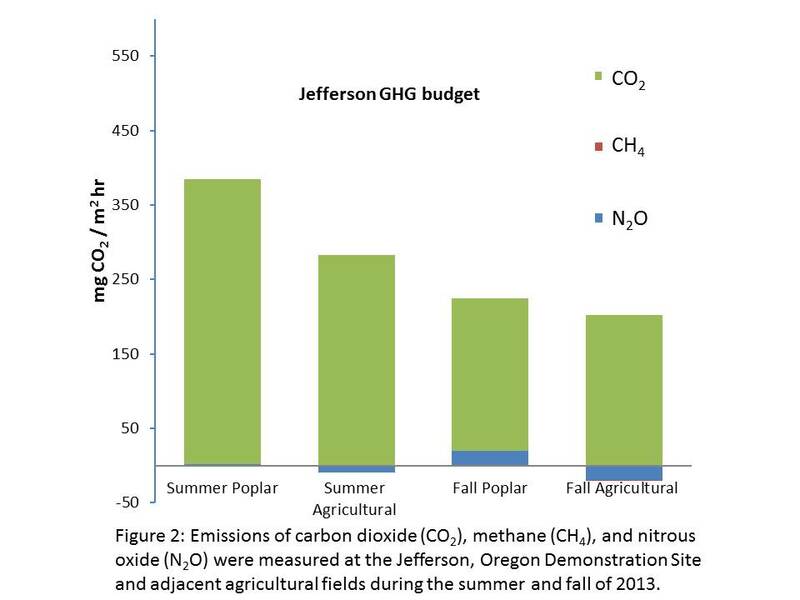 Preliminary results indicate that poplar tree farms do not release significantly more carbon dioxide than agriculture lands (Fig 2). At just three percent of the total greenhouse gas emissions on poplar bioenergy farms, methane and nitrous oxide emissions are comparatively small, but it is important to document these emissions as well because their heat-trapping potential in the atmosphere is much higher than carbon dioxide. 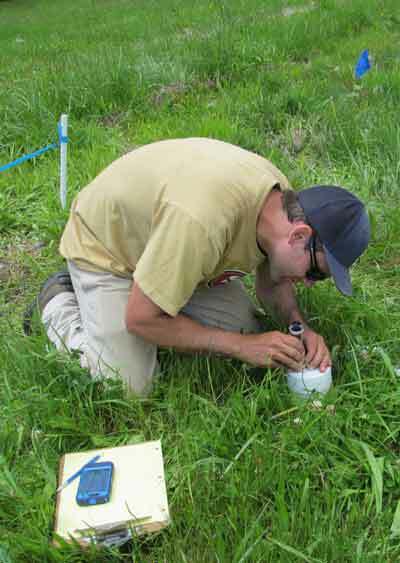 Summer measurements in 2013 indicate that soils at the poplar demonstration sites tended to consume more methane than agricultural soils, possibly due to a higher availability of oxygen in the soil. However, fall measurements after harvest and plowing show that the agricultural soils consumed more methane than the poplar sites, possibly due to the introduction of more oxygen into the soil from plowing. Soils at the poplar sites tend to produce nitrous oxide, while soils in nearby agricultural fields tend to be consumers, although the difference is again not statistically significant. Researchers are still trying to discern why this may be the case. So far, the research indicates that when land is converted to poplar bioenergy farms, greenhouse gas emissions from soils are not significantly different from those in surrounding agricultural lands. Going forward, researchers will be looking at how the fall 2013 harvesting of poplar at the Hayden and Jefferson sites will affect soil emissions. One theory is that the large number of fine roots from established poplars provides more organic matter for soil microbes to feed on resulting in greater production of carbon dioxide. In the larger picture, poplar roots also store carbon, which helps reduce greenhouse gas concentrations in the atmosphere. An assessment of carbon storage in poplar roots must be considered along with analysis of soil emissions in order to determine the overall impact on greenhouse gasses.